Today, July 16, the United States Mint tagged "sold out" to the first of its 2012 First Spouse Gold Coins. No longer available is the proof coin honoring Alice Paul and the Suffrage Movement. It appears the proof’s production was capped at 3,500 since its latest sales through to Sunday reached 3,502. That marks a new sales low for proofs going back to the series start in 2007, though more of the 2012-dated coins could finish lower. The previous low was 3,655, held by the proof Lucretia Garfield coin from 2011. Alice Paul and the Suffrage Movement Gold Coins debuted on October 11, 2012. Even though it was late in the year, they were the first 2012 spousal coins released since the series was delayed as a result of production issues. The proof Alice Paul Gold Coin sold out Tuesday while priced at $840, which is markedly lower than its opening price of $1,054. Uncirculated Alice Paul Gold Coins remain available for $820 each, an also more attractive price compared to their opening at $1,041. It has current sales of 2,486, which places the sales total for both coins at 5,988. The U.S. Mint had announced a maximum mintage of 13,000 across the proof and uncirculated options, but demand from collectors decides actual production totals. The series has suffered greatly since the first year and after gold prices soared. Each coin includes one-half ounce of 99.99 pure gold and their prices change up to weekly depending on the market value of gold. The inaugural 2007 Martha Washington First Spouse Gold Coins debuted in the low $400 area, nearly half of what it costs for today’s coins even after gold’s $370+ plunge this year. Alice Paul was not a First Lady but the authorizing law for the 24-karat gold series mandated her depiction since there was a design opening as Chester Arthur’s wife died before he became President. The unique situation supported early demand as opening sales for Alice Paul Gold Coins were the strongest since 2010. Sales across the proof and uncirculated versions combined to 3,200 in less than five days. Here are the latest sales totals for each of the 2012 coins. 2013 First Spouse Gold Coins will honor Ida McKinley, Edith Roosevelt, Helen Taft, Ellen Wilson and Edith Wilson. The U.S. Mint notes through its online product schedule that on sale dates for these coins are yet to be determined. Update: As expected, the United States Mint on Wednesday did increase the price of the proof American Platinum Eagle by $50 to $1,800. Prices for numismatic gold coins did not change. The United States Mint adjusts prices for its collector gold coins up to weekly based on an average price of gold and how that sits within its coin pricing matrix. Current gold coin prices are based on an average of gold that is within $1,250 and $1,299.99 an ounce. Pricing cuts were missed last Wednesday by $6.01 and in the first Wednesday of the month by a single penny. While gold has jumped significantly from a week ago, it has not popped into a new range. Expect prices for First Spouse Gold Coins and other U.S. Mint gold products to remain unchanged. There is a good chance the U.S. Mint will increase the price of the 2012-W Proof American Platinum Eagle by $50 as the average for platinum has comfortably moved up a tier to within $1,400.00 to $1,449.99 an ounce. The London PM platinum Fix on Wednesday is the price to watch. If that fixing is at or above $1,400 an ounce, expect last year’s Platinum Eagle to move up to $1,800 from $1,750. That would also be the price for the 2013-W Proof American Platinum Eagle when it launches at noon ET on Thursday. Who the hell was Alice Paul? And what does she have to do with a president? Nothing whatsoever. She just happened to have been born during the Arthur administration, just as my great-grandmother did, and millions of other women as well. But rather than commemorate Arthur’s wife Ellen, who died before becoming First Lady, or Mary Arthur McElroy, who served as his official White House hostess, the US MINT elected to ignore these close relatives of Chester Arthur, and instead focus their efforts on a person who had nothing at all to do with Arthur’s time in office. The reason is actually pretty self-explanatory if you understand the underlying progressive agenda which motivates the people who make these decisions. First of all it isn’t the mint that makes these decisions, it’s Congress which put it in the law. The mint was only following orders. Secondly I would not say that Congress has a progressive agenda. Otherwise why are we still minting the penny or printing the $1 bill? 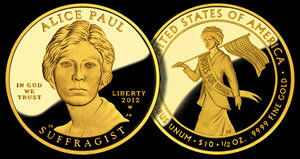 Personally I look at the Alice Paul as the third commemorative coin of the year when only two are allowed by law. It is totally anomalous within the spouse coins – no resemblance to the spouse coins and no resemblance to the no-spouse Liberty sub-series either. It’s the only spouse coin I bought for that very reason. It seems that each new Spouse issue hits an all time low for mintage. I’ve said before and I’ll say it again, the public’s attention span cannot seem to last more than 4 years. The mint has had plenty of time to gather a “lessons learned” from modern coins issued. Susan B. Anthony lived an interesting and fruitful life in US history. Bad laws and minting decisions sentenced her coin to the collecting gallows. Even with the fluctuating price of Gold how many collectors do you think can afford to collect the entire Spouse series? How many have the attention span to stay with the series? There will always be a few… 3.500 and subtracting. dollars. My foresight is not very good. If the tea party gets it’s way the economy will be driven further into a triple deep recession from which we may never recover (as some economists have predicted) and gold prices will climb to new highs. Then you can re-evaluate your foresight.